As nations become wealthier, it is harder for them to sustain high rates of growth. That doesn’t mean that the United States is in decline, or even stagnating. When a nation is as rich as ours, it can realize larger absolute gains than it did in the past and larger gains than other nations even if it has lower growth rates. That’s because a growth rate of, say, 2.5 percent represents a larger increase in absolute wealth the richer an economy becomes. In 1900, a 2.5 percent increase in gross domestic product (GDP) per capita would have translated into about $150 in today’s dollars for every man, woman, and child in the United States. In 2010, it would have been roughly $1,200, reflecting the fact that in the aggregate, we are about eight times wealthier than we were 110 years ago.3 By focusing too much on growth rates and too little on absolute increases in wealth, we have failed to appreciate the magnitude of economic gains in recent decades. The distinction between absolute gains and relative gains has been roundly ignored in the way that policy makers, analysts, and the media conceptualize economic growth. Comparing ourselves to what might have been if we had experienced higher growth rates, rather than to what our actual income and wealth were in the past, makes us feel that we are doing worse than our predecessors when we are actually better off. This comparison unnecessarily increases worker anxiety and is as likely to inspire selfishness as generosity among voters. Perhaps most troubling, the focus on growth rates misdirects our attention from the minority who are struggling to the broad majority who are doing well, leading progressives to suggest costly universal policies, or mistargeted ones, when more- focused policies aimed at the poor would be more appropriate. For all the talk about stagnant growth, you’d have a hard time divining it from looking at the material circumstances in which most Americans live. Even after the Great Recession, we live in larger houses and own more cars than previous generations. Our homes are cluttered with all manner of gadgets, electronics, and appliances. Air-conditioning and air travel, once considered luxuries, are now available to virtually all of us. If our obvious material affluence seems difficult to square with various narratives of economic decline, that’s because it doesn’t. What has declined is the rate of improvement in our lives. From 1947 to 1979, average family income grew by 2.4 percent per year, while it grew by half that from 1979 to 2007. But the lower growth rate since 1979 masks impressive absolute gains. The annual increase in average family income was $860 in today’s dollars, not all that much less than the $970 annual increase from 1947 to 1979, despite the lower rates. And even this comparison understates the gains that we can expect in the future because we are at the point where we will soon be rich enough as a society that annual gains will be permanently higher than they have ever been, even if growth rates remain low. Source: GDP per-capita estimates are from Louis Johnston and Samuel H. Williamson, “What Was the U.S. GDP Then?” MeasuringWorth.org. Nominal figures are adjusted for inflation using the implicit price deflator for GDP. 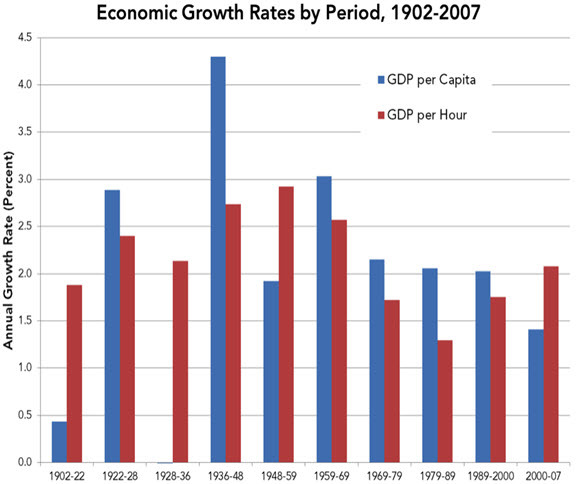 Prior to 1948, GDP per-hour estimates are based on real gross private domestic product per hour, while 1948–2007 GDP per-hour estimates are based on real GDP per hour for the total economy. Estimates for 1900–1947 are from the Historical Statistics of the United States, Millennial Edition Online, Table Cg265-272. Estimates from 1948–2007 are from National Income and Product Accounts real GDP estimates, Table 1.1.6, and unpublished annualized quarterly hours are from the Bureau of Labor Statistics Office of Productivity and Technology, courtesy of Robert Gordon, Northwestern University. I averaged the quarterly hours for each year. Points in the chart are nine-year averages centered on each year shown. Source: Author’s computations from National Income and Product Accounts real GDP estimates, Table 1.1.6, and unpublished annualized quarterly hours from the Bureau of Labor Statistics Office of Productivity and Technology, courtesy of Robert Gordon, Northwestern University. I averaged the quarterly hours for each year. While some have referred to the aughts as a “lost decade,” absolute growth was higher from 2000 to 2007 than from 1959 to 1969, an apples-to-apples comparison because both periods are between business cycle peaks. Even though GDP per capita rose by only 1.4 percent per year between 2000 and 2007, less than half the 3 percent per year from 1959 to 1969, annual absolute gains were $650 per person compared to $600 in the 1960s. Consider what would have been required to have maintained 1960s growth rates. If we start with actual 1969 GDP per capita and begin applying annual growth rates of 3.0 percent, the absolute increase per person in 1970 would have been $700. In 1990, after cumulating annual 3 percent gains, the per-person increase would have been $1,264. By 2010, a 3.0 percent increase in per-capita GDP would have amounted to $2,283 — more than three times the actual 1970 increase. That certainly would have been nice — much better than the $922 gain we actually saw — but it is asking a lot from the economy to produce ever-bigger absolute gains from ever-higher initial levels. It is an unreasonable expectation — it demands bigger absolute gains year after year not because prices have increased (inflation adjustment takes that into account) and not because we work harder (estimates of productivity growth control for hours worked). Just … because. To believe that compensation growth should have remained at an annual rate of 3.2 percent after the 1950s is to believe that today’s workers should be twice as rich as they actually are. Further, it is to believe that they should then get a raise next year over five times larger in constant purchasing power terms than the raise received by workers in 1952. It is one thing to expect annual absolute income increases and quite another to expect annual increases that grow ever more generous, forever. As living standards rise, workers might choose to continue putting in the same amount of work and reaping higher incomes, but more likely they will choose to cut back their work hours. Doing so would be consistent with the steady increase in leisure time enjoyed by American workers over the last century. Nobel laureate Robert Fogel projects that the decline in hours worked in the 45 years from 1995 to 2040 will exceed in percentage terms the decline over the 115 years from 1880 to 1995.15 Based on historical patterns, he projects a 30-hour workweek in 2040 and continued declines in the typical retirement age. Writing in 2000, he noted that the fraction of American men aged 60 to 64 that were in the labor force had declined from close to 100 percent in 1880 to 50 percent. Unlike men, women have increased their paid work hours dramatically, but because their unpaid time doing housework has declined more, their leisure time, too, has risen. Growing demand for leisure and family time, as evidenced by increasingly widespread concerns over work-family balance, suggests that work hours might be on the verge of declining among men and women alike. Of course, not every worker cuts back his or her hours voluntarily, and the slow recovery of labor markets since the Great Recession has heightened long-standing fears that technological change might throw increasingly large numbers of people out of work. This is the theme of the recent book Race Against the Machine, by economists Erik Brynjolfsson and Andrew McAfee. Fears of mass technological unemployment, as Brynjolfsson and McAfee acknowledge, have existed alongside technological development since at least the time of John Maynard Keynes, but they have not materialized. However, even if technological unemployment were to substantially increase the jobless ranks, as Brynjolfsson and McAfee fear, the economy might increasingly be rich enough that we can easily afford expanded safety nets. Arguably, that is what we are already seeing in the rising number of working-age men receiving federal disability payments. We may have reached a point where living standards are high enough that disability benefits, which are tied to earnings levels, can afford less-skilled men a comfortable (if not luxurious) lifestyle, at least when combined with other income sources. A rich society with an underclass of financially comfortable unemployables supported by an overclass of highly skilled analysts and a resentful middle class is an unattractive future. But there is no reason that even this worst-case scenario must come to pass. Work-sharing arrangements used by European nations and a number of US states during the recession show how the cost of falling demand for labor can be distributed broadly in the form of reduced hours for multiple workers, rather than landing entirely on the worker who would be laid off. Growing affluence might eventually facilitate a costless version of work sharing, allowing even part-time work to sustain less-skilled workers comfortably. We should, of course, pursue a best-case scenario that raises the skill levels of workers and increases demand for the less-skilled workers who remain. The most effective way to raise skill levels is to improve our educational systems. Practically, this means that progressives must compromise with conservatives by pairing greater spending on the one hand with stronger accountability, more choice for parents and students, and greater flexibility for principals and school districts on the other. Taking advantage of new technologies to promote distance learning in higher education could bring down the cost of postsecondary education dramatically, opening it up to more young adults. The best way to boost demand for less-skilled workers is to have sustainable strong economic growth. Higher growth rates are still better than lower ones, after all, and we should be striving for the rates of the Golden Age. However, it is not clear that we know how to attain them. Republicans have blamed the growth slowdown on the expansion of government, high tax rates, excessive regulation, and a safety net that has sapped initiative. Democrats have blamed changes in the global economy that have been abetted by laissez-faire policies, weak national industrial policy, thin safety nets that dissuade risk taking, and insufficient federal efforts to counter rising inequality. But even if everyone ends up better off than their parents, that does not mean that those starting at the bottom of the ladder must end up any higher, relative to their peers, than their parents were. Among today’s 40-year-olds, two in five who started out in the bottom fifth of incomes as children remain in the bottom. If today’s most disadvantaged children in 25 years have more money than their parents did, work less, but remain equally unlikely to “be whatever they want when they grow up,” then in an important sense, we would remain a nation with limited opportunity. Here is where progressives would be wise to prioritize their policy goals. The United States is an affluent nation — richer than any comparable society the world has ever seen — even as our affluence has grown at a diminishing rate. Yet to hear many progressives tell it, one would think most Americans were losing ground. By focusing on disappointing economic growth rates, we have missed the fact that today, low growth rates produce absolute growth that surpasses that seen in the Golden Age of the mid-20th century. Obsessed with comparing ourselves to doppelgängers in some world where unusually high growth rates prevailed, flying around in jet packs and teleporting to the moon, we have been dissatisfied with continued gains and even with annual improvements that surpass the previous high-water marks. Politics is about prioritizing. The more time, energy, and dollars we spend on the overstated economic problems of the middle class, the less we can devote to the poor. The poor are certainly better off than in past decades, but one in five American household heads still reported that sometime in 2010 they worried about whether their food budget would fall short before the month ended.23 Only 13 percent of children starting in the bottom fifth will end up in the top two-fifths in adulthood (compared with 63 percent of children who start out in the top two-fifths). 2. I am working on a companion piece that will argue that the “stagnation” of earnings and income for middle class families represents a historical correction and return to the long-run trajectory of growth that productivity gains would predict. 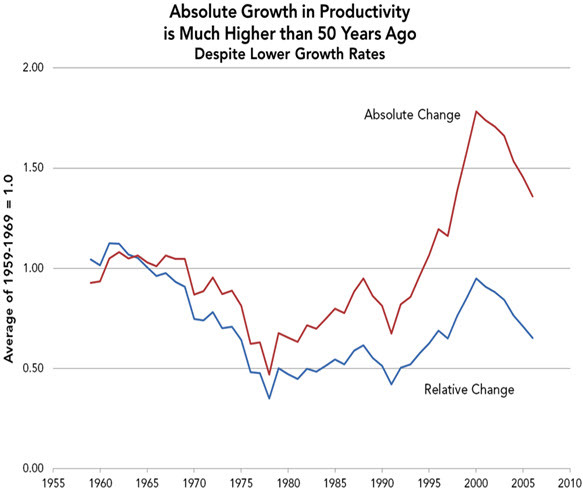 Wage growth outpaced productivity growth in the middle of the twentieth century, and recent decades have restored wage levels to historical patterns by allowing productivity to catch up. The historic shift of married women into the workforce also produced invaluable benefits to women that are not captured in measures of GDP, income, and earnings. 3. GDP per capita estimates are from Louis Johnston and Samuel H. Williamson, “What Was the U.S. GDP Then?” MeasuringWorth.org. Nominal figures are adjusted for inflation using the implicit price deflator for GDP. All dollar amounts in this essay are in 2010 dollars. 4. Presenting rolling averages allows the longer-term patterns to emerge from noisier year-to-year changes and ensures that the results are not sensitive to the starting and ending years chosen. The scaling allows the trends in the relative and absolute rates to be compared easily. I chose to use 1959-69 as the benchmark because it represents a period that started and ended with a business cycle peak and was followed by a period of slower growth. 5. Some researchers believe that the increasingly common practice of offshoring production to low-wage countries has overstated economic growth over the past fifteen years. Government economists within the Bureau of Economic Analysis acknowledge the methodological issue but believe it to be relatively minor, constituting at most 0.1 to 0.2 percentage points of annual real GDP or productivity growth (and likely less due to offsetting biases). See here and here. At worst, this issue would marginally change the quantitative figures presented in this essay without affecting the broader point that a focus on absolute growth should change our evaluation of trends in living standards. 6. Per worker estimates use the same GDP figures as the per capita and per hour estimates. Estimated number of workers prior to 2001 are from the Historical Statistics of the United States, Millennial Edition Online, Table Ba478-486. From 2001 to 2010, they are from http://www.census.gov/statab/hist/02HS0029.xls and the 2010, 2011, and 2012 editions of the Statistical Abstract of the United States. Charts for per capita and per worker growth available from the author on request. 7. Keep in mind, all of these absolute growth figures are in real, inflation-adjusted terms. So it is not that we have more growth but a dollar today is worth less than a dollar in the past. They are also in “per capita,” “per worker,” or “per hour” terms, so increases in population, employment, or hours worked do not affect these estimates. The different growth measures have different trends because of changes in the share of the population that works (e.g., due to shifting retirement or schooling patterns, to rising labor force participation among wives, or unemployment) and changes in the number of hours worked per worker (e.g., due to greater frequency of voluntary or involuntary part-time work). 8. Again, there remains the question of how this growth was distributed, but even here the picture is more complicated than progressives believe, as my companion piece to this essay will show. 9. Total compensation of employees in domestic industries is from National Income and Product Accounts, Table 6.2, and hours worked by full-time and part-time employees is from Table 6.9. Estimates are adjusted for inflation using the Personal Consumption Expenditures deflator from the National Income and Product Accounts Table 1.1.4. 10. Actually, this characterization understates the importance of levels of wealth and absolute growth. Holding constant changes in the age profile of the workforce and other population dynamics, what a 41-cent increase in pay really means is that, for example, 39-year-olds in 2004 received 41 cents more in 2005 than 2004’s 40-year-olds did. In the absence of growth, the 2004 39-year-olds would have received pay raises that left them in 2005 with the same average pay as the 2004 40-year-olds. If all else is equal—that is what zero growth means—the 2005 40-year-olds would make no more than the 2004 40-year-olds did. But they would still have made more than they had in 2004 as 39-year-olds. For sake of illustration, assume that workers of a given age in both 1951 and 2004 would have received raises of one percent even in the absence of growth, purely as a consequence of becoming more experienced or skilled. In that case, the increase in pay experienced in 1952—as a result of aging and economic growth combined—would have been 4.8 percent, while the increase experienced in 2005 would have been just 2.2 percent. But because pay was so much higher in 2004 than in 1951, the absolute increase for a worker with average pay would have been $0.74 an hour in 2005 rather than the $0.56-an-hour increase in 1952. 11. Angus Maddison, The World Economy, Volume 2: Historical Statistics, Tables 1c and 2c (Organization for Economic Co-operation and Development, 2006). The twelve European countries are Austria, Belgium, Denmark, Finland, France, Germany, Italy, Netherlands, Norway, Sweden, Switzerland, and the United Kingdom. 12. I computed these rates using 1969-2001 estimates from Maddison and 2001-2009 rates from OECD.StatExtracts. All cross-national comparisons I cite use figures adjusted for differences in purchasing power across countries and over time. 13. Note that I am not heralding the so-called “Singularity,” where technological advances lead to an almost impossibly accelerating rate of improvement in our wellbeing. My argument is not that rates of growth will increase any time soon (though they may). I am simply noting that even the diminished growth rates of the past few decades imply large absolute gains in our material conditions. 14. So I will argue in a future complementary essay to this one on the distribution of growth. Male wage growth has lagged productivity growth because productivity levels have had to catch up to the over-heated union-driven wage growth of an earlier era. Once productivity has caught up, the two should move in tandem in the future. 15. Robert W. Fogel (2000), The Fourth Great Awakening and the Future of Egalitarianism (Chicago: University of Chicago Press). See Chapter 5. 16. Indeed, simple demographics appear to be a big part of the story. Changes in the composition of the workforce—due to baby booms, the rise in immigration, and the increased labor force participation of married women—may have lowered experience and skill levels. Changes in schooling and retirement—and increases in longevity—have altered the ratio of workers to non-workers. 17. Pew Economic Mobility Project (2012), “Pursuing the American Dream: Economic Mobility Across Generations.” See also Julia B. Isaacs (2008), “Economic Mobility of Families Across Generations,” in Isaacs, Isabel V. Sawhill, and Ron Haskins, Getting Ahead or Losing Ground (Pew Economic Mobility Project). 19. See Bruce D. Meyer and James X. Sullivan (2011), “The Material Well-Being of the Poor and the Middle Class Since 1980,” American Enterprise Institute Working Paper #2011-04, and Richard V. Burkhauser, Jeff Larrimore, and Kosali I. Simon (2011), “A ‘Second Opinion’ on the Health of the American Middle Class,” National Bureau of Economic Research Working Paper 17164. 20. See Mark Schmitt (2012), “If Liberals Want to Help the Poor, They Should Focus on the Middle Class,” The New Republic online. 21. Samuel Lubell (1952), The Future of American Politics (New York: Harper). 22. These computations are based on median family income estimates found here, adjusted for inflation using the Personal Consumption Expenditures deflator. The figures indicate a 128 percent increase from 1952 to 2010, but adding the value of health insurance would push this significantly above 130 percent. 23. From the U.S. Department of Agriculture’s Economic Research Service.